Saint Catherine of Alexandria vanished from the reformed Roman Calendar in the reform of 1969 and, Deo gratias, reappeared in 2002. Why? Part of the answer can be found, I think, by comparing the lovely old Collect for Saint Catherine with the one newly composed for the 2002 edition of the Roman Missal. O God Who gavest the Law to Moses on the summit of Mount Sinai, and didst miraculously place the body of Thy blessed virgin-martyr Catherine in the selfsame spot by the ministry of Thy holy angels, grant, we beseech Thee, that her merits and pleadings may enable us to reach the mountain which is Christ. O ADONAI, and Ruler of the House of Israel, who appeared unto Moses in the burning bush and gave him the Law on the summit of Sinai: come to redeem us with an outstretched arm! 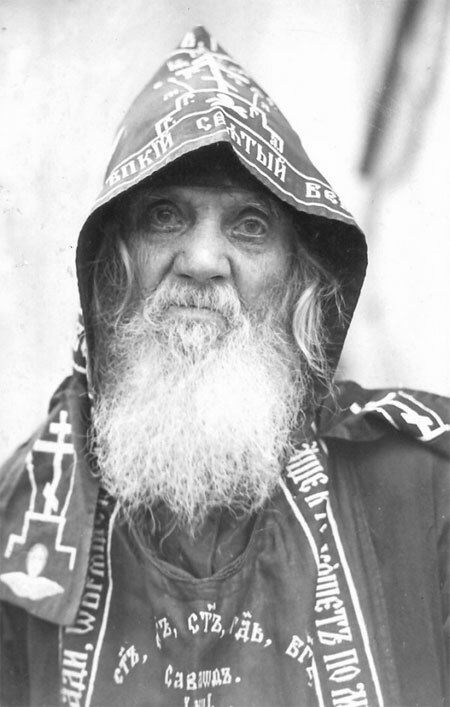 Given that the life of monks, dedicated to the ceaseless praise of the Thrice-Holy God, has often been compared to that of the Angels, monks have, at various times, been called “angels.” (See Père Louis Bouyer’s classic book, The Meaning of the Monastic Life.) The translation by “angels” may have been carried out by monks! The newly composed Collect for Saint Catherine does not make use of the biblical mountain imagery; instead it focuses on the work of Christian unity. Saint Catherine, cherished and greatly venerated in the East, becomes in the new Collect an intercessor for the unity of the Church. Almighty and eternal God, who gavest to Thy people the invincible virgin and martyr Saint Catherine, grant that, by means of her intercession, we may be strengthened in faith and constancy, and spend ourselves unsparingly in working for the unity of Thy Church. Our faith leads us to become pilgrims in the footsteps of God. We contemplate the path He has taken through time, revealing to the world the magnificent mystery of His faithful Love for all humankind. 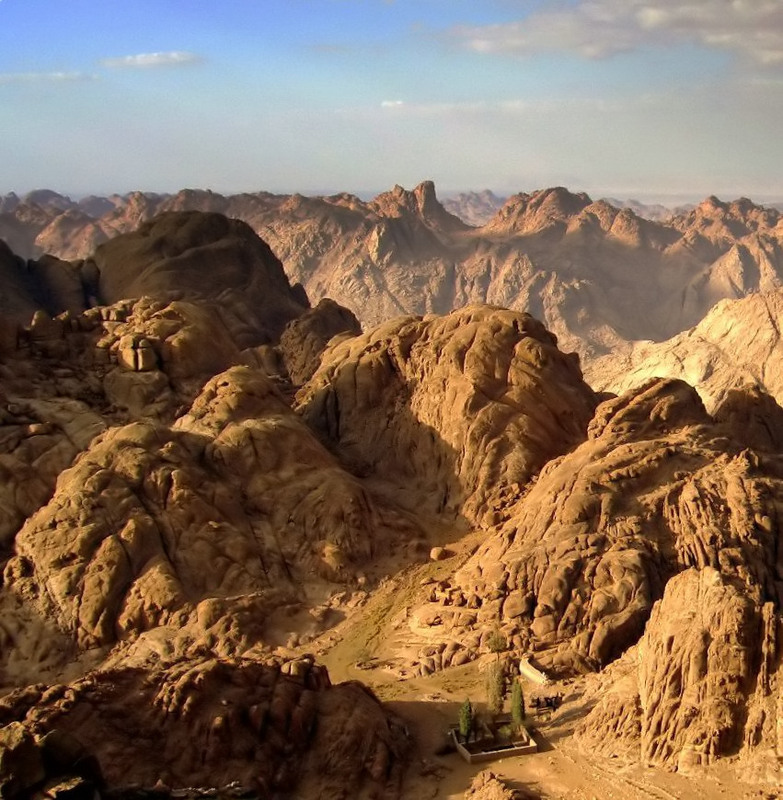 Today, with great joy and deep emotion, the Bishop of Rome is a pilgrim to Mount Sinai, drawn by this holy mountain which rises like a soaring monument to what God revealed here. Here He revealed his name! Here he gave his Law, the Ten Commandments of the Covenant! God shows Himself in mysterious ways – as the fire that does not consume – according to a logic which defies all that we know and expect. He is the God who is at once close at hand and far-away; He is in the world but not of it. He is the God who comes to meet us, but who will not be possessed. He is “I AM WHO I AM” – the name which is no name! I AM WHO I AM: the divine abyss in which essence and existence are one! The God who is Being itself! Before such a mystery, how can we fail to “take off our shoes” as He commands, and adore Him on this holy ground? 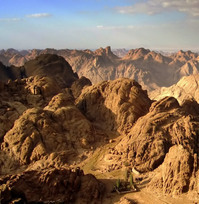 The monks of this Monastery pitched their tent in the shadow of Sinai. The Monastery of the Transfiguration and Saint Catherine bears all the marks of time and human turmoil, but it stands indomitable as a witness to divine wisdom and love. 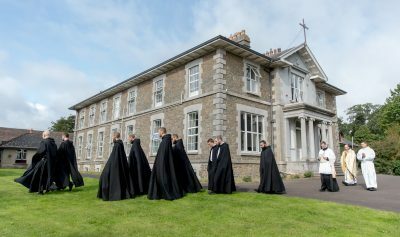 For centuries monks from all Christian traditions lived and prayed together in this Monastery, listening to the Word in whom dwells the fullness of the Father’s wisdom and love. In this very Monastery, Saint John Climacus, wrote The Ladder of Divine Ascent, a spiritual masterpiece that continues to inspire monks and nuns, from East and West, generation after generation.
. . . in the new millennium the Monastery of Saint Catherine will be a radiant beacon calling the Churches to know one another better and to rediscover the importance in the eyes of God of the things that unite us in Christ. This, it seems to me, enriches the ancient feast of Saint Catherine of Alexandria with another perspective: “the importance in the eyes of God of the things that unite us in Christ.” So then, which Collect should we use today? I would suggest that we do a very Catholic thing and use both of them. My preference would be to retain the traditional prayer at Holy Mass and the major Hours and use the new one at the Little Hours and, perhaps, to conclude the General Intercessions where these are done.